Consumer behavior is changing at a dazzling pace. 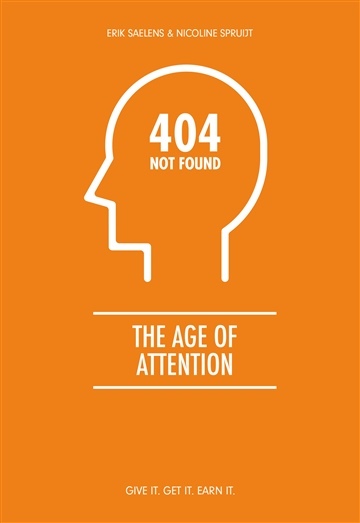 Smartphones, social media, new technologies … grabbing someone’s attention has never been more difficult. But there is more. The demands of a younger generation, new privacy regulations, mistrust of the establishment, uncertainty as to whether news is fake or not: all are challenges brands will have to face in order to stand out. In The Age of Attention, Erik Saelens and Nicoline Spruijt offer a manual to help you go from getting to giving and finally to earning consumer attention. The time has come for marketers to sit down with consumers and get personal. Because if you don’t follow them, they won’t follow you. Erik Saelens is a consultant and interim manager with over 15 years’ experience in brand marketing and communications. He currently holds the position of strategy director at Brandhome. Erik specializes in rebranding and renaming operations, and has researched more than 250 brand-change operations worldwide. He is also an expert on brand management and M&A and IPO strategies, and draws on a strong operational background when putting these strategies into practice. Erik has a solid track record too as an interim manager, performing various roles for a range of international companies and brands. Erik is the author of Brandhome Platform I: Over maatschappij, mens en merk, which explores the relationship between branding, society and individual people. Erik created the Triple-A brand index and published a book on Triple-A brands in 2012 in English and Arabic. In 2013 he published the book about the Brandhome method®. He is a regular guest speaker at conferences and universities, and a frequent contributor to specialist sector media in Benelux. Erik is currently finalizing a new book on rebranding operations. Erik holds Belgian nationality and is fluent in English, Dutch and French.